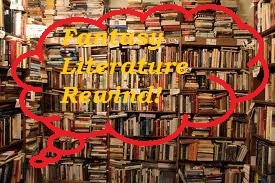 Fantasy Literature Rewind: Darby O'Gill and the Good People. What started as a day to venerate a Catholic saint has since been embraced as a general “Irish Appreciation Day”, celebrated with a veritable mish-mash of Ireland adjacent things like Celtic music, beer, soda bread, more beer, corned beef and cabbage (note: corned beef is much more Irish-American than Irish) and that ubiquitous mascot for the holiday here in the U.S.: the leprechaun. 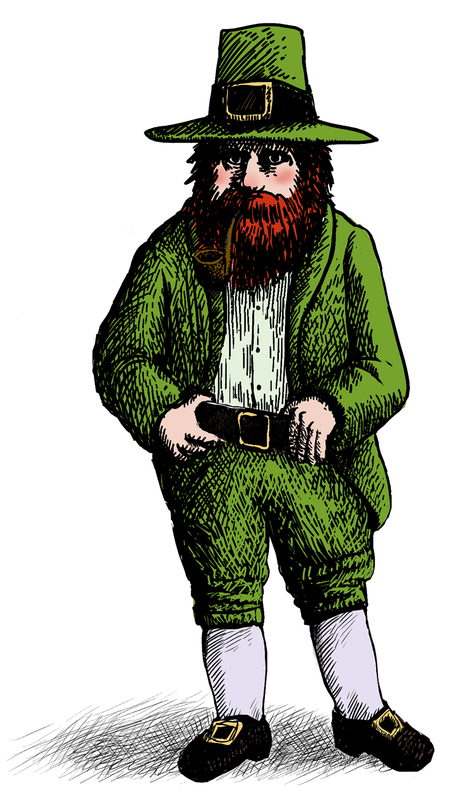 Now, don’t get me wrong, leprechauns are a part of old Irish fairy lore and all. However, they’re just one little part alongside clurichauns, pookas, changelings, banshees, etc. Yet, they've come to represent all of Irish lore for Americans. So, how did this particular bit of lore get latched onto so firmly by the Americans? Well, I have a theory. One of the easiest ways to get Americans to warm up to the new groups that are coming onto their shores is to tell them the right story. With the Italians it was the whole Christopher Columbus thing (which is a whole subject unto itself). Now, the Irish faced a lot of trouble when they emigrated to America. So, which story may have won over the preexisting Americans? I think it may have been Darby O’Gill and the Good People by Herminie Templeton Kavanagh. 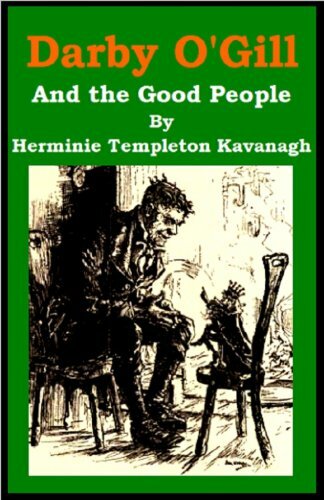 Kavanagh was an early 20th Century writer. Her father was Irish, but she was born in the UK and was married to a couple of different men in her lifetime, one of whom was a judge from Chicago. So, she seemed to spend a fair bit of time split between the British Isles and the American continent. Her stories based on Irish lore were first published as a series in McClure’s magazine and were collected into a book in 1903. This is a book you may have heard of or you may not have. It was made into a Disney movie under a slightly different name, albeit one of their live action ones. This book is comprised of basically three stories. 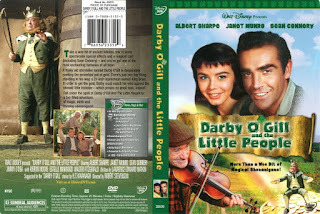 The first is aptly titled “Darby O’Gill and the Good People”. The second is “How the Fairies Came to Ireland”. The third is “Darby O’Gill and the Leprechaun”. The first story introduces us to our hero, an average man by the name of Darby O’Gill from Tipperary, Ireland. When he discovers that one of his cows is missing, presumably taken by the fairies, he sets out to get it back. This leads him into the realm of the fairies where he makes friends with the fairy king. This eventually leads to an escape in which he tricks the fairies into giving up not just his cow but also a number of human beings they had taken over the years. The second story features the local priest who’s travelling when his horse loses a shoe on the fairies’ hill. The king of the fairies shows up with some of his blacksmiths to help shoe the horse. While they’re working, the fairy king tells the story of where the fairies came from and how they came to Ireland. The last story features the return of Mr. Darby O’Gill. This time, he catches sight of a leprechaun and uses the three wishes he gets to try and one-up his wife (who he seems to squabble with a fair bit) by creating a family castle and all the associated finery. Things don’t go quite to plan, though. All three stories were pretty good. I could have done without them being written in dialect (First Uncle Remus and now this one. Why do I seem to keep finding these books lately). “Broguing” aside, they were perfectly enjoyable stories that played pretty faithfully with Irish fairy lore. There is one notable exception and it’s a story that seems to purposely rewrite the lore. That would be the second story “How the Fairies Came to Ireland”. You see, one of the older bits of lore about where fairies came from is that they’re actually fallen angels. The idea being that unlike the devil fell all the way to Hell, the fairies only fell to Earth. The result of this is that the fairies can’t pray and they can’t stand a pious word being said in their presence. So, if you say something like “Lord be with you” they cringe and snarl and act like they’ve been personally insulted. So, the story starts with Father Cassidy wondering what great sin they must have committed to get kicked out of Heaven. So, when he talks to Brain Connors the king of the fairies, he’s given a different story. Connors tells him that the fairies were actually a different race that was created and lived in Heaven. However, when the war between Lucifer and God happened, the fairies refused to choose a side. So, in punishment for sitting out the war and not helping their creator, they were cast out of Heaven and sent to Earth. Honestly, I personally like this take on the fairies’ origin. It was always hard to believe they were fallen angels because they didn’t seem quite evil enough. Yet, they also weren’t quite good. Granted it does make the “Powers That Be” seem a bit petty. The other stories are good too. The first one plays on the lore of animals and people disappearing into the fairy realm. It doesn’t go quite as far as to do the whole changeling thing but it does do the other parts and provides a hero clever enough to figure a way out of it. The third story really focuses on the lore I mentioned at the beginning: the leprechaun. It stays pretty faithful to it. The shoemaking is there. The bit about keeping your eyes on them or else they disappear is there. The story goes with a “three wishes” prize rather than a “pot of gold” prize but I’m pretty sure both versions exist in folklore. Here though, our hero takes on a different character. If our hero mister Darby O’Gill was clever in the last story, here he’s stubborn, quarrelsome and kind of foolish. Honestly, while I enjoyed the stories, I was a little disappointed I didn’t find more of what I was looking for. I was expecting to find more of the roots of the “Hollywood” Irish lore you see in cartoons and stuff. You know, all that cliché American Saint Patrick’s Day stuff. For example, there weren’t any banshees in the book. TV takes on Irish lore love setting up banshees as villains and leprechauns as the good guys (this is a gross oversimplification of any sort of fairy creature). Oh well, there are other Darby O’Gill books. One is The Ashes of Old Wishes and Other Darby O’Gill Tales (an out-of-print book which I can’t seem to find for less than $100) and another is Darby O’Gill and the Crocks of Gold. Maybe that stuff shows up in there. Anyway, at least the book was pretty good. 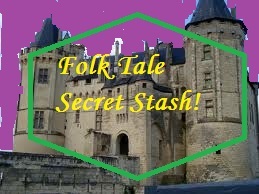 Folk Tale Secret Stash: Tayzanne. I had wanted to get this post up in February for Black History Month, but it didn’t happen. Of course, we should also consider that I shouldn’t be ignoring stories from black cultures for 11 months out of the year either, so hopefully this will all be a wash in the long run. Now, when it comes to folk tales from the African Diaspora, it’s easy to remember the various African countries and it’s easy to remember the United States, at least for us white folks who are on the outside of it. But when I started getting into folk tales and storytelling more seriously in college, some of the first tales I learned about were from another very important place predominantly populated by black folks that might slip the minds of us pasty people: the Caribbean. I especially encountered a lot from Haiti. Haiti is an interesting country even beyond its folk tales. It is located on the island of Hispaniola, to the west of the Dominican Republic. Like many countries in the Caribbean, it was created by colonial powers because of the desire for sugar plantations. The country of Haiti, for various reasons, is regarded as a developing nation (what we used to call “third world”). However, beyond its economic status, Haiti is rich in culture. Including an often misunderstood spiritual heritage (Haiti is home to the religion called Vodou, or as Hollywood likes to say it “Voodoo”). Haitian culture is something that could take up a whole post (or book) on its own. This story is entitled “Tayzanne” and is taken from the book The Magic Orange Tree and Other Haitian Folktales collected by Diane Wolkstein. 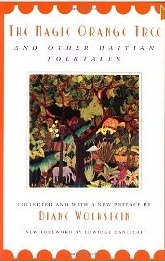 According to Wolkstein, it is in fact one of the more popular tales in Haiti. Every day, either Velina or her younger brother would be sent to get water. One day, as Velina is getting the water, her ring slips off. Now, what should surface but a big silver-golden fish. Velina asks if the fish has seen her ring? The fish dives under the surface and returns with the ring on his nose. Now, my readers who are fans of European tales will probably notice some similarity to the Grimms’ “The Frog King”. Not to get all Joseph Campbell-y (Campbell being a scholar who sometimes overemphasizes the commonality between old stories) but there are some story elements that do exist between cultures. Anyway, Velina introduces herself and the fish introduces himself as Tayzanne (note: in Creole, this name is actually a pun on the word for “hooked”). Tayzanne then tells Velina that he lives in the deepest part of the spring where the water is clear and sweet and offers to dive down and get her some. Velina obliges and Tayzanne is given the bucket and swims down to retrieve the clear, sweet water and brings it back. Now, Velina and Tayzanne become friends and it becomes a regular thing that Velina would bring back the clear, sweet water from deep in the spring. But Velina’s mother starts to notice that the water Velina’s brother brings back is not as clear or sweet and she gets mad. She orders her son to do better. So, Velina’s brother decides to follow Velina and see where she gets her water. Now, before going forward any further, a quick “time out”. You may be wondering what the big deal is with finding the best water. Well, in many cases with folk tales I make a note about how certain commonplace things now weren’t so easy to get in times past. Stuff like getting fruit out of season or finding clean water. Here’s the thing, though. In some parts of the world, finding clean water is still hard to do. In many third world countries (and I’d bet Haiti is among them) access to clean, drinkable water is still challenging, as is using that water for things like proper sanitation. There are foundations that are entirely devoted to that cause. So, keep that in mind as we continue. Velina’s brother then goes home and tells his mother that he can now bring home water as clear as Velina’s. And he tells her all about Velina and Tayzanne and how he will just sing the “Tayzanne” song. His mother does not like this one bit. She is now convinced that Tayzanne is an evil spirit that lives in the water. Now, that’s where I’m going to stop. I’ve given you a little taste of this story, but you’ll have to find the rest yourself. I will tell you that the end of this story is a bit . . . bittersweet. One thing that I hope is not going to stop though, is my attempt at branching out the tales on Fairy Tale Fandom beyond the usual cultures I spotlight. Will I be able to keep it going or fall back into old habits? Only time will tell. And if anyone’s still thinking about that whole clean water thing, you might want to check out THESE ORGANIZATIONS.